I would have to say that pretty much says it all–having listened to the music now on the soundtrack you gave us, I realize just how perfect the music was–it was hard to focus on the music all the time so I’m glad I had the soundtrack because I could hear what everyone else heard while we were too busy talking to each table of guests. I also love how you kept us on track and all your announcements were PERFECT! Everyone said that they really enjoyed that the music during dinner was “dinner music” and not too loud so they all could carry on a conversation at the table–something many of them say they can’t do at most weddings and is a pet peeve. Danielle & Nick BianchiRonald Reagan Building & ITC - Washington, D.C. Between our contacting you many months ago up until the day of the event, you did an incredible job facilitating communications, guiding us through the process, incorporating all of our suggestions, and providing advice and suggestions. And let me dwell on that last point for a minute. The sheer number of weddings you have done has given you an incredibly deep well of experience, something which was priceless to us. For example, it gave us tremendous confidence that you had done many weddings in the same venue as ours, and you knew precisely what to do to make sure the marble floors and open air lobby didn’t create an echo chamber. Another vendor (who had not worked the Old Ebbitt before, mind you) told us, “That won’t be a problem, don’t worry.” But, the fact that you knew it was a challenge of this particular venue – and that you knew precisely what to do to compensate – that kind of expertise is invaluable. That expertise is why, on the day of the actual wedding, we knew we truly didn’t have to worry about that. You had it under control. It was also important to us that our music to reflect the “playfulness” of our personalities; we wanted to avoid the stuffy “same old, same old” pomp of a traditional ceremony. And following that mantra, you created an amazing itinerary and song-list that really complimented our personalities and requests well. Plus, the tempo was perfect: no phase felt rushed, everyone had an amazing time, and everything came together wonderfully. And then, after the event is over, to have you send us high-definition, high-quality recordings of the entire event as well?! That was a fantastic surprise. Ed, I speak for myself and Debbie when we thank you wholeheartedly for making our special day all the more special. And I would not hesitate for one second to recommend your services to anyone else planning their own special day. Thanks again so much for being part of our memories. Ted & Debbie KowalskyOld Ebbitt Grill - Washington, D.C.
Ed was excellent! My Husband and I were very concerned about the choice of DJ. We had both been to events where the DJ was very distracting. We knew what we DIDN’T WANT—someone who was obnoxious, loud, used a cheap sound system that made their voice muffled and inaudible, and that basically turned the party into a sleazy night club. We didn’t know exactly what we DID WANT until we used Ed! He was clear and audible when we needed him to make announcements and otherwise blended into the background when the party was going on. The music selection was perfect—always complimenting the mood and never drawing undo attention to itself. 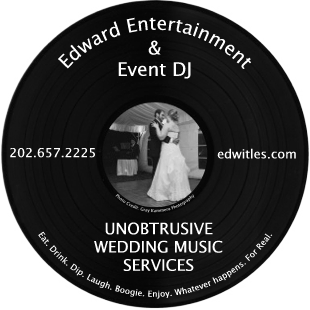 We would DEFINITELY recommend DJ Ed Witles to anyone who wants a class act for their special day. When you work with Ed, The Elegant DJ, you know everything will be taken care of. I watched him in action this past week (at the reception for Supreme Court Justice Scalia’s son), and he managed to keep the dance floor full the entire evening. He knows how to read the guests and play the songs necessary to make sure everyone is having a great time. His setup is unobtrusive yet sounds fantastic. Ed is a great DJ… one I highly recommend!!! I can’t tell you how many compliments we got on the music – everyone absolutely love it!!! As for something special, my Dad came up and told me that during dinner, people at his table were wanting to dance and asked how soon it would be before we could dance!! People also LOVED the Greek music and dancing – I must thank you so much for that – you hit it out of the park! Also, playing our Scotts Royal Dragoons song from Last of the Mohicans as our last song and dancing to it with my husband was a special moment that I will cherish! Many thanks and best holiday wishes! !